If there is one dinner that everyone in the family is likely to love it’s pizza night. Whether your family loves the gooey cheese or looks forward to bites filled with spicy sausage, pizza provides a quick, easy way to dish out a delicious family friendly dinner. The best part about Pizza Night is that there are so many different ways to do it that every family can find the option that is perfect for them. After years of financial ups and downs, many families treat eating out as a rare treat rather than a weekly event. But ordering a pizza doesn’t have to break the bank. Treat your family to an extra special pizza night by taking advantage of the great deals and coupon offers from local pizza restaurants. If you are short on time or short on clean dishes, take out isn’t your only option. Grab a few frozen pizzas and a package of paper plates from the grocery store and you have a dinner that is quick and easy to make and quick and easy to clean up. If you have more time than money, pick up some pre-made pizza crusts, pizza sauce, and your family’s favorite toppings at the store and then assemble them yourself. This option also makes it possible to combine the toppings your family loves the most, even if they aren’t toppings you would typically find together. Share the work and the fun by letting each family member create their own pizza. This is a great way to get everyone together for more than just a few minutes when everyone’s mouth is full. As a bonus, this option ensures everyone gets to make their favorite kind of pizza. For the lowest cost option, you can start from scratch and make your own dough, create your own sauce, grate your own cheese, and chop up your own toppings. This option will take more time, but if you assign a task to each family member, you can cut down the amount of time needed while increasing the time spent together. It is really easy to get stuck in a pizza rut. We tend to find a combination of toppings we like and stick with that selection every time we order pizza. Mix things up a bit by trying some new toppings or new topping combinations. While most pizza features a tomato based sauce, there is no rule that says every pizza has to be made with this kind of sauce. In fact, you can find several different options on menus and in grocery store freezers including white sauces, BBQ sauces, and even pizzas made with no sauce at all. You can also go a little crazy when it comes to the crust if you are making it yourself. Infuse the dough with parmesan cheese or garlic or even pesto for a pizza filled with flavor. Make your own stuffed crust pizza by adding cheese under the crust before baking. 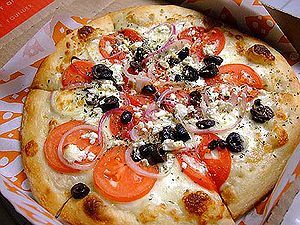 Plan a pizza night with your family and try one of our very own pizza favorites from Fill Your Plate, Abby’s Yummy Veggie Pizza. This entry was posted in Cooking, Recipes and tagged Arizona, Cheese, Cook, Dinner, Dough, Fill Your Plate, Home, Mozzarella, Pizza, Tomato sauce. Bookmark the permalink.